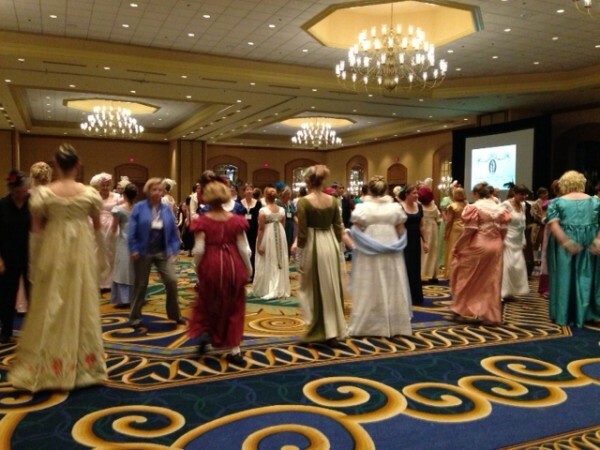 Having a Ball at the JASNA AGM | Shannon Winslow's "Jane Austen Says…"
It was great! I’m so glad I went! 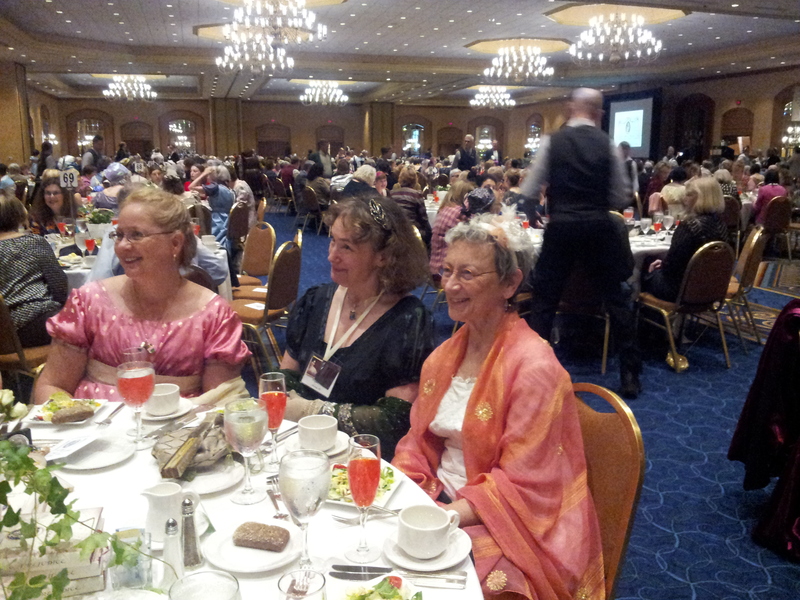 That’s my reaction to my first Jane Austen convention – the Jane Austen Society of North America’s Annual General Meeting, held in Minneapolis a week and a half ago. So here’s the blow-by-blow I promised you in my earlier post on the subject (see Minneapolis, Here I Come). I flew out of Seattle on Wednesday afternoon (September 25) with heavy suitcases bearing books and high expectations for all I would see and do in the next four days. My first goal upon arriving in Minneapolis was to connect up in baggage claim with my friend and roommate for the weekend, fellow Austen Author Susan Mason-Milks, who was also coming from Seattle on a different flight. What happened next was a sign for how the weekend would go. 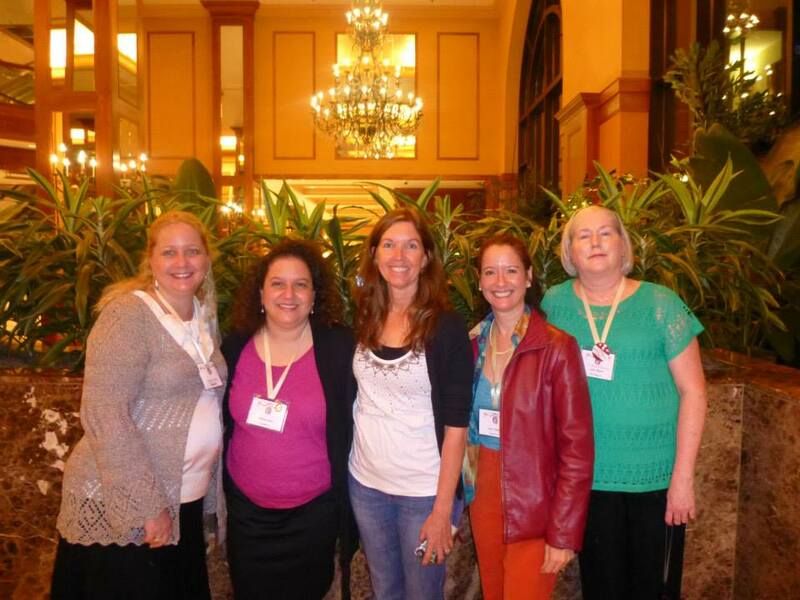 Before I could even meet up with Susan, I stumbled across four other Janeites whom I knew but hadn’t expected to find, at least not so soon! All six of us ended up piling into a van-style cab together. And at the hotel, these fun and fortuitous meetings just kept coming. 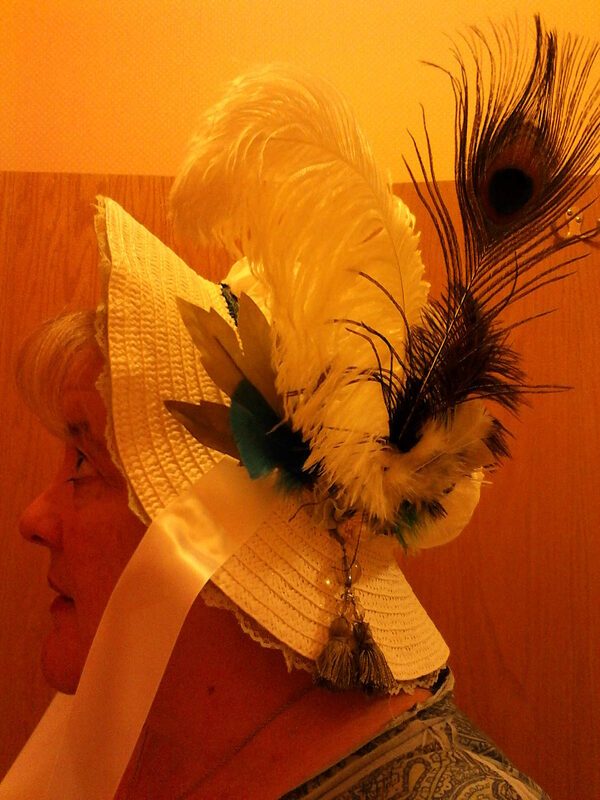 The first thing on my schedule for Thursday morning was a “Bonnet Workshop,” where I hoped to make something to wear the rest of the weekend as occasion required, since I hadn’t managed to fit my only other hat into my suitcase. Two hours and a gobs of hot glue later (not period-correct millinery technique, admittedly), I had something I was reasonably pleased with. What do you think? The rest of the day was filled informative sessions (Regency Magazines, The History of Tea, etc.) and meeting with friends over meals. 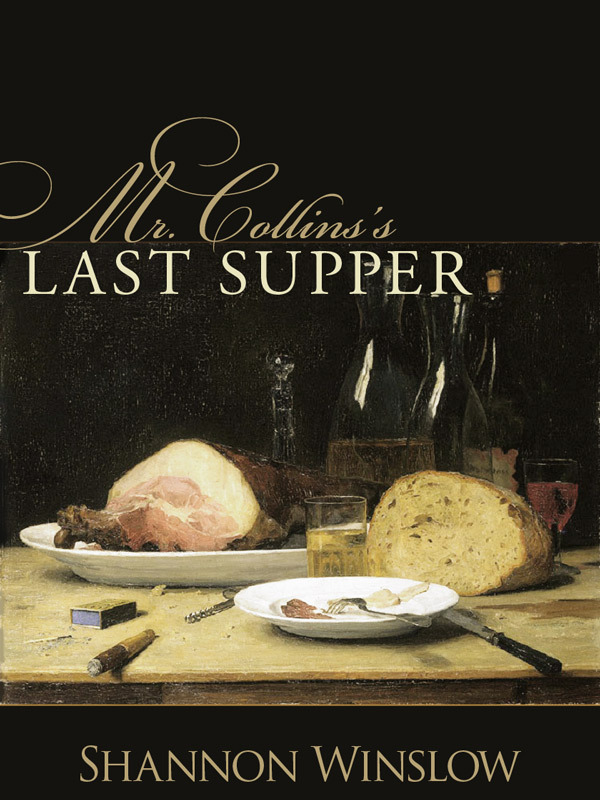 Friday afternoon, Plenary Speaker John Mulland gave a fascinating talk entitled “Speechless in Pride and Prejudice,” expounding on the significance of silences and silent characters in the novel. Did you know that there are two important characters in the book that never actually say a word (they have no lines of dialogue)? 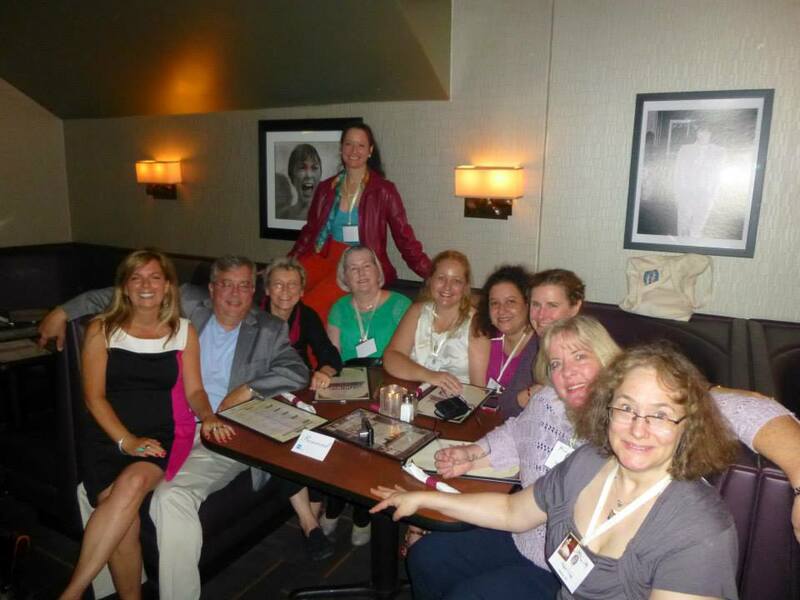 Read more here, Susan Mason-Milks’s post about the AGM at Austen Authors. Later in the day, I participated in the “Author Signing” – an array of about 25 authors with published books (fiction and non-fiction) related in some way to Jane Austen. 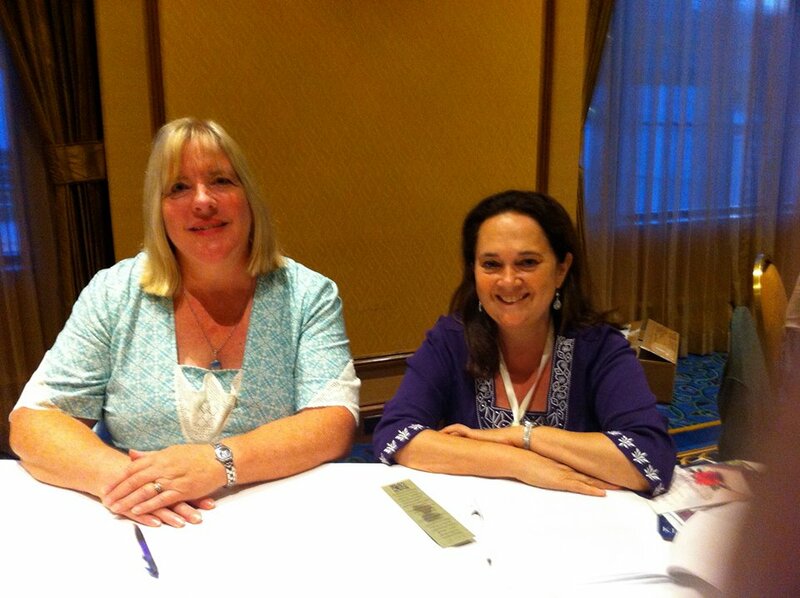 I got to sign a few books and postcards, to meet some of my lovely readers, and also visit with my fellow authors, including my tablemate – scholar, speaker, and author Emily Auerbach. During this session, I managed to snag a few authographs for myself as well. 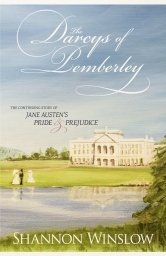 Another special event followed on Friday evening – a dinner gathering together in person an entire community of folks normally connected mostly via the internet: the present members of the Austen Authors group, along with bloggers, and other JA enthusiasts. There were about 30 of us, and we very noisily took over one entire end of an English pub style restaurant for a couple of hours. 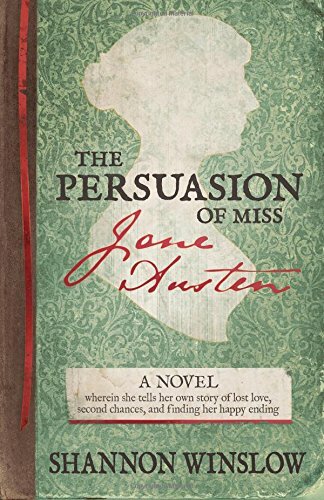 Who knew that Jane Austen fans could be so rowdy? Marilyn Brant, Susan Mason-Milks, Shannon Winslow, C. Allyn Pierson, Syrie James, Sharon Lathan, Abigail Reynolds, and Maria Grace. More excellent and informative sessions followed on Saturday, leading up to the climactic events of the convention: the banquet, the promenade, and the Regency ball. 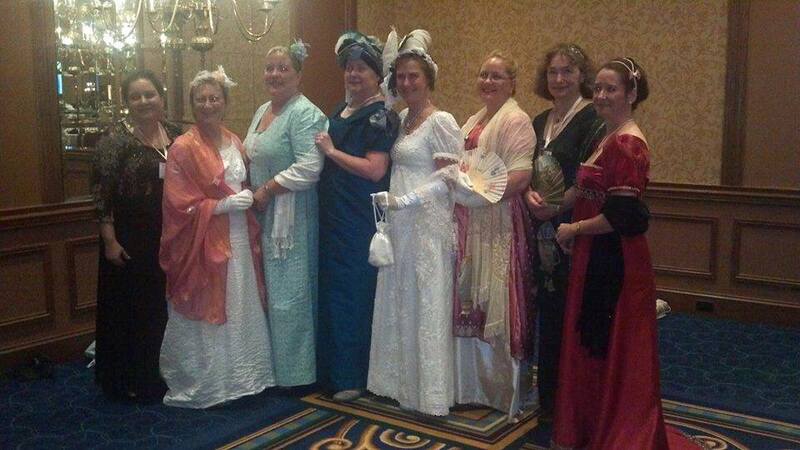 This was the time to pull out all the stops and appear in your best period costume. I only had a “morning” dress to wear, not a proper ball gown. Where I fell a little short in the wardrobe category, however, I think I made up in enthusiasm. “I danced every dance!” as Lydia boasts in P&P’95. The only minor blight on the evening was the lack of enough gentlemen partners (we ladies outnumbered them at least 20 to 1!). But that didn’t slow us down. This style of dancing doesn’t require the typical male/female roles. So, yes, I danced with girls most the night… and had a wonderful time! Here’s a link to a video of the dancing. I’m in the semi-chaotic scene somewhere! http://www.youtube.com/watch?v=GK8LtFdsM9o&feature=youtu. I’ve got one more bit of fun to tell you about before I finish this longer-than-usual post. 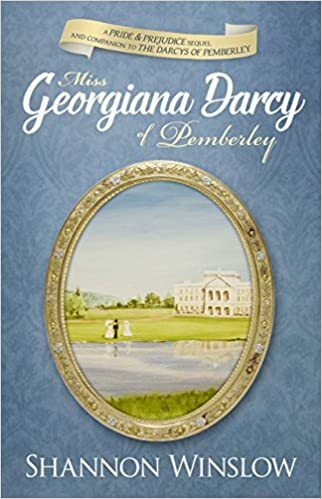 As I expected, the best part of going to the AGM was the chance to meet new people, as well a many I’d only known over the internet before – fellow Austenesque authors, other Janeites, and even a few of my fans! What I didn’t anticipate is that I’d also get to know a lovely author of whom I am a particular fan: Julie Klassen. 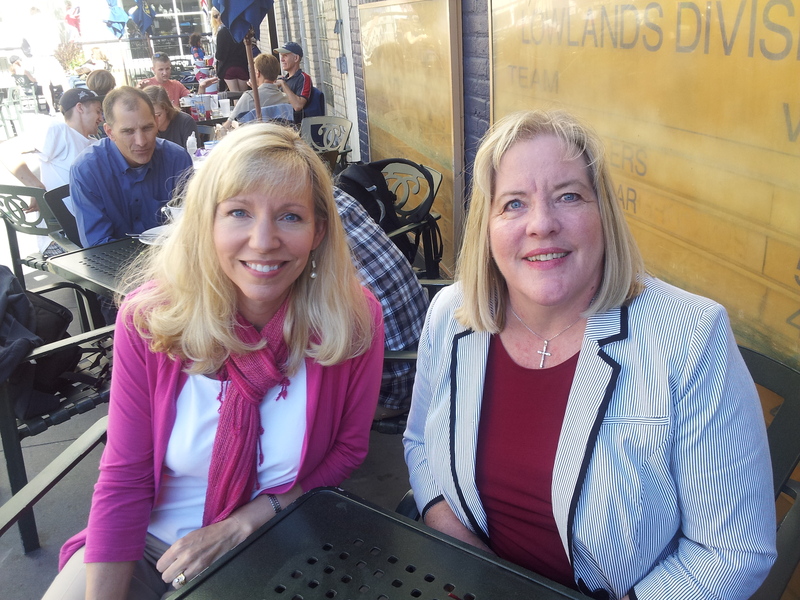 I introduced myself to her at the author signing on Friday, and then we bumped into each other several times afterward. We even ended up as dance partners for a while at the ball and shared a late lunch (along with Abigail Reynolds) Sunday afternoon before I caught my plane home. Just the icing on the cake of an already-great weekend! So there you have it – all the highlights from my experience at the AGM. It was well worth the trip, and I hope to go again. Next year’s event will be in Montreal. Will I see you there? 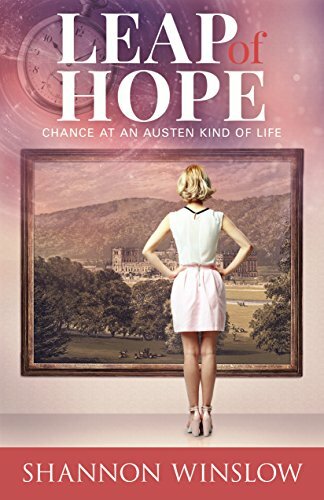 This entry was posted in Austen Authors, Jane Austen, Jane Austen Quotes, learning, my books, travel, Uncategorized and tagged Austen Authors, Jane Austen, Jane Austen convention, Jane Austen quotes, JASNA, Julie Klassen, Pride and Prejudice, Shannon Winslow. Bookmark the permalink. Thanks for sharing this with us! It was so wonderful seeing everyone in the photos! 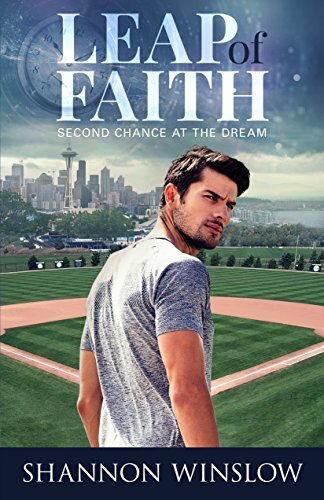 I’ve learned of so many new authors to add to my library. Very excited to dive into great reading by the fireplace this winter! I LOVE your hat, btw! You looked beautiful in your gown – morning or otherwise. It was lovely! Thanks so much. You’re good for my ego, and I’m glad you enjoyed the post! Shannon, I am sure you couldn’t even begin to describe how exciting the weekend was for you! You definitely are experiencing the rewards and fruits of your labor. I still remember the passion you shared in stopping the video ‘Pride and Prejudice’ a million times to interpret word for word what the actors were expressing. I thoroughly enjoyed the commentary on your weekend adventure and appreciate your sewing and creative talent in making a beautiful gown and hat! Love your bonnet- I didn’t get to see it in person, but it looks wonderful in the pic! It was great to finally meet you! Yah, I didn’t get as much use out of the bonnet as I had hoped, not yet anyway. So good getting to know you too, and the other AuAu’s. That alone was worth the trip. Thank you for sharing!! I did somehow miss this post! It sounds like there is so much fun to be had at the AGM! I think I’m dying to go to one myself! It’s worth doing at least once in your life, Meredith. Hope you get the chance.